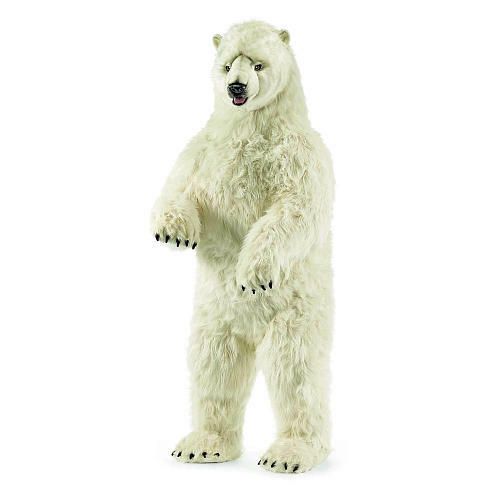 I was cruising around the FAO Schwartz web site last night hoping to preclude actually going into their mayhem of a store when we’re in New York in two weeks when I found this: a five-foot tall polar bear reared up on its back legs. I’m sorry, but what parent in his right mind is going to get his kid, presumably a small kid, something this large and terrifying? Actually, not even: what person is going to get something this intimidating to live in his home? You don’t have to watch Colbert to know that bears are a threat. And from what I hear, polar bears are especially unpredictable and mean. I’m not saying they shouldn’t be – extreme cold makes me crabby and I don’t usually have to hunt my own lunch further than the ski lodge french fry line in those conditions. Yes, their little cubs are adorable, but I’m just saying, I wouldn’t invite one into my home, even if it is fake and frozen in position. When I was eight and went to swim in my grandmother’s swimming pool, I was convinced there was a shark in there. I couldn’t see it, but that was because it had seen me and swum down to the other end of the pool, camouflaging itself in the refracted light. Maybe I was wrong, but who’s going to take that chance? Just because no one had lost a limb yet didn’t mean it wasn’t there. It was like Bush’s WMD. Or that joke about elephants painting their toenails red so they can hide in cherry trees: the fact that you haven’t seen one just means it’s working. I know whereof I speak. A few years ago, in the middle of a margarita-soaked afternoon, I bought an almost-life-sized cardboard stand-up Aragorn. He hung out in our apartment just barely within my line of sight when I was lying in bed. I had to evict him a few months later because my nerves couldn’t take the strain of waking up to a short-ish, tunic-clad, long-haired intruder in the foyer. My point is this: the world is intimidating enough when you’re knee-cap height on the rest of the household and dependent on others to provide your Cheerios. You don’t need a giant bear in the corner to keep you in your place. That’s all I’m saying. Shout out to the little people. 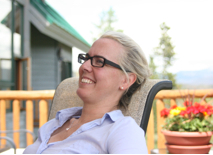 Your post reminds me of when I was single and living alone…I had a dreadful fear of someone breaking into my house in the middle of the night and doing all sorts of unmentionable things to me. I went with some friend to a shooting range one day and brought home one of the silhouette posters I had shot. I hung it in my entryway in an attempt to thwart the evil intentions of my as of yet unknown attacker. All I ever really accomplished was scaring the bloody hell out of myself every time I entered my home.